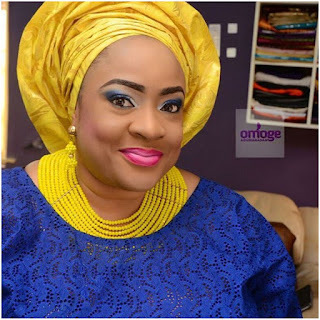 HAWT TALK WITH TOSAN: Nollywood Actress Foluke Daramola believes "a man should be a step ahead of a woman"
Nollywood Actress Foluke Daramola believes "a man should be a step ahead of a woman"
"I’m sorry I don’t think men and women should have equal rights in this case. I think the male should have more than the female, but it should be with proportion, maybe on a ratio of 60 to 40. The reason why I think so is because we women tend to be extremely domineering when it comes to issues and sometimes sentimental. Men can be detailed even though we are sometimes. So, there are proportions in all these things. The role of a man can never be over emphasized. Even though I’m a woman rights activist, I still believe in the place of a woman and a man. The man is supposed to be a step ahead of the woman; you can never take that away." never be over emphasized but so is the role of a woman! In fact in many families today, the WOMAN is the bread winner or contributing as much as the man financially. Let's not get started on how we sacrifice our bodies, time and EVERYTHANG to raise children(both male and female). We are not asking to be the dominating partner...no one should. We just want to earn the same as our male counterparts, be treated fairly in the unfortunate case of a divorce, be respected even if we are single etc. Girl please take several seats. This is the smartest Nigerian woman infact the smartest woman on earth period. God bless her. im sure this will like both likes and dislikes, but good on her for speaking her mind!